Once upon a time in a land far away, my dear husband ignored my specified plans for Valentine’s Day and did me one better by planning an elaborate outing to a fabulous city complete with a shopping spree to a yarn shop! Yes, I have nominated him for husband of the year. 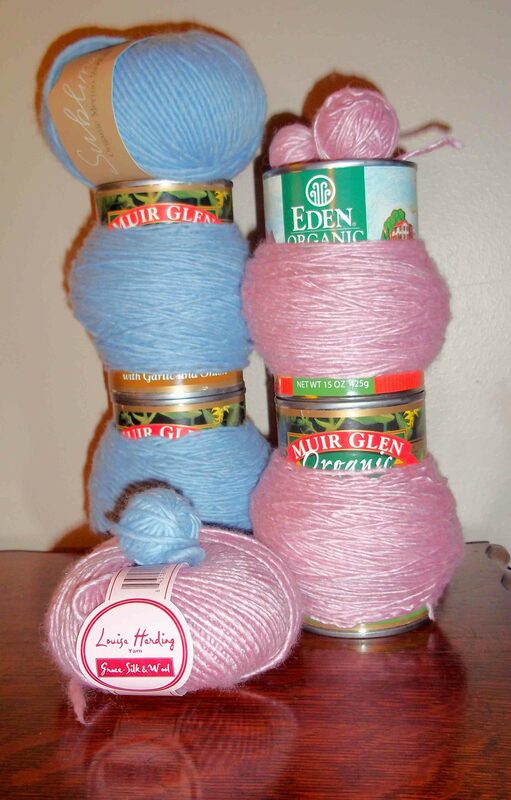 I oohed and aahed my way through the store and opted for two scrumptious yarns. 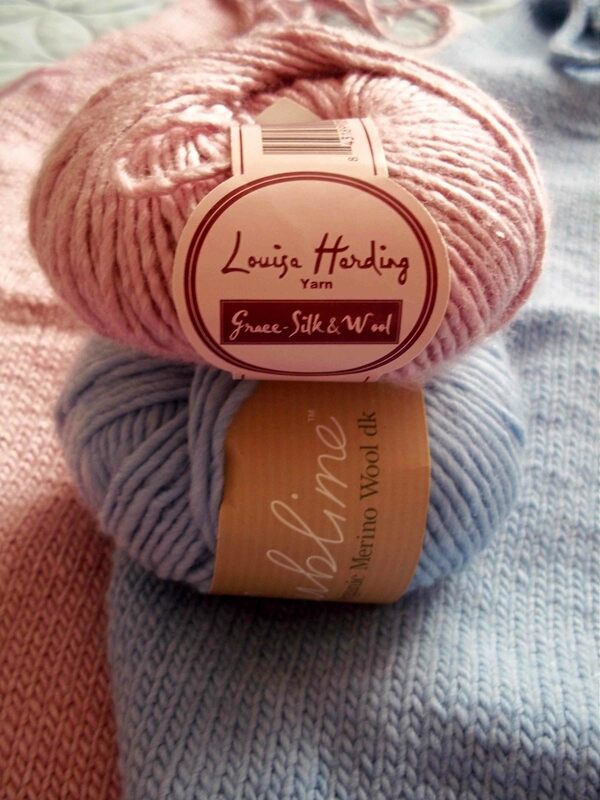 Louisa Harding Grace – Silk & Wool in what I like to call ‘Valentine’s Pink’. Sublime Organic Merino Wool DK in what I like to call (and you would probably agree) Baby Blue. 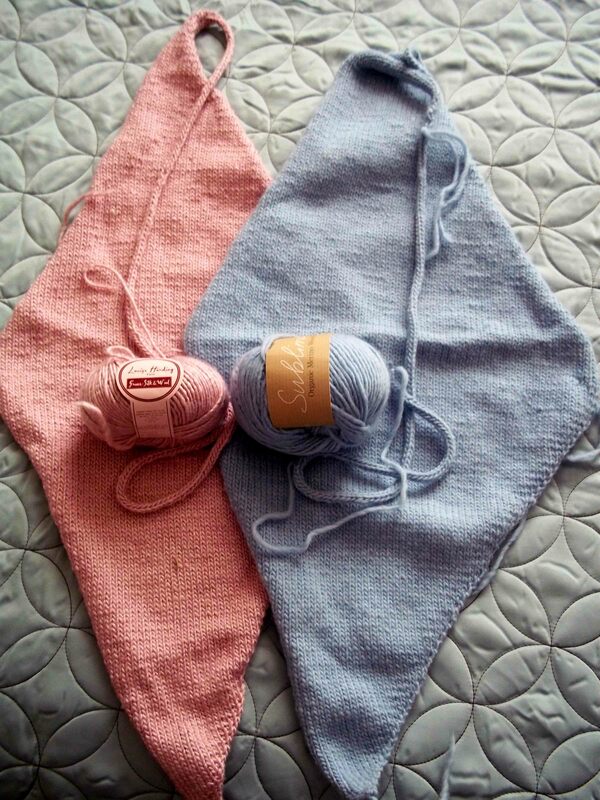 At the time I was reading Bag Style from Interweave Knits and there was a certain origami inspired Two-Tone Triangle felted purse I thought these two colors would be ideal for. I knit up a test swatch and felted it. The silk in the Louisa Harding gave the felt a nice sheen. So, needles blazing I knitted up the two required triangles in record time complete with i-cord handle. Triangles waiting to be pursefied. This project made me think that I need a yarn cooling off period before knitting begins. Because, the project languished away for several reasons, not the least of which is, I hate sewing. I started circular knitting in pursuit of a dream that I would never have to sew a seam ever again. I know it’s not really feasible, but it’s my goal. Maybe that’s why I like socks so much. And another thought crept in. This yarn is too good for felting. This soft, luxurious yarn should be worn against the skin, not be agitated in the washer and made into an accessory! I was on the verge of yarn sacrilege. So, I did something I’ve never done before. I ripped out the project. It’s funny (and by funny I mean not) how knitting just unravels when you don’t want it to, but when that’s your goal, not so much. But I learned several valuable lessons: 1) Always start from the bind off edge; 2) I pierce the yarn when knitting more often than I realized; 3) If you wait years before frogging a project it’s not such a knife in the gut. I am not sure what this yarn will be, but it won’t be felted, that’s for sure! I am open to suggestions if you have one! After its role as can warmer, what should this yarn become?